A recent report, published by Southern Water, East Sussex County Council and the Environment Agency, demonstrates the benefits of achieving water-efficiency through the installation of low-flush WCs. Toilet flushing accounts for up to a third of total domestic water consumption, so the use of low-flush WCs can offer significant water and cost savings. The project report outlines the details of a trial, funded by the EU, in which low-flush ES4 WCs were used in a primary school, to verify their water saving potential and performance. The ES4 4.5 litre* WC was used to replace seven 9 litre toilets in St Leonards primary school in Hastings, and water usage was carefully monitored over several months. Measurements indicated an overall reduction of approximately 38% in the volume of water used for flushing in those units replaced during the trial. The performance standard of the new WCs was also much higher and bad smells and blockages disappeared, despite the vastly reduced flushing volumes. 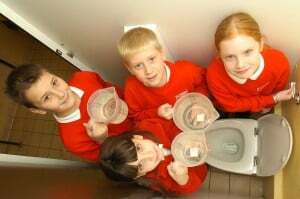 Previously, the school had also had to spend an average of £150 per month on unblocking drains and the high performance of the new toilets has allowed them to save this needless expense. The premises manager at St Leonards primary school reported that the new toilets were virtually maintenance-free, due to their robust design. For more information on Green Building Store’s range of water-efficient sanitaryware, please go to www.greenbuildingstore.co.uk or call 01484 461705.